Rat-Rod/Hot-Rod Billet Aluminum Single Groove Pulley kit. This kit will work on all Small Block Chevy Motors. Will Not Fit Corvette Or Stock Chevy Truck Short Pumps. 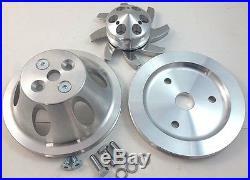 (1) Machined Finished 1 Groove Aluminum Water Pump Pulley. (1) Machined Finished 1 Groove Crank Pulley. (1) Machined Finished Alternator Pulley. (1) Polished Aluminum Alternator Fan. (4) Water Pump Pulley Bolts (Used If Running Electric Fans). (3) Chrome Crank Pulley Bolts. Bolt circle for water pump pulley is 1.75" with a 5/8" pilot hole. Water pump pulley is 6-5/5 in diameter. Crank pulley is 6-5/8 in diameter. 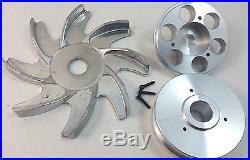 Alternator pulley is 2.80 in diameter. This will not work on early 265-283 with riveted on pulleys. Will not fit Corvette water pumps or early stock GM trucks. See my store for Polished Aluminum options. The item "SB Chevy SBC 1 Groove Belt Aluminum Pulley Kit SWP Short Water Pump 283 327 350" is in sale since Monday, October 23, 2017. This item is in the category "eBay Motors\Parts & Accessories\Car & Truck Parts\Engines & Components\Belts, Pulleys & Brackets". The seller is "tssperformance" and is located in Chatsworth, California. This item can be shipped worldwide.